TM 1-1520-240-10 2-5-3 Figure 2-5-2. Cyclic Stick Grip 2-5-5. AFCS Trim Switch. NOTE If the longitudinal CCDA fails, it can be recog- nized by loss of pitch trim or failure of the centering devise to release. A centering spring in the pitch axis allows these forces to be over-come. The AFCS trim switch (fig. 2-5-2) is used to make small changes in the pitch (airspeed) and roll attitude while the AFCS is operating. The switch is spring-loaded to center off position. Moving the switch forward or aft from center off position commands an increase (forward) or de- crease (aft) in airspeed by driving a trim motor in the longitudinal CCDA. Moving the switch left or right commands the roll ILCA to bank the helicopter in the selected direction without mov- ing the stick. Power is supplied to drive the pitch trim motor from No. 1 AC bus through CLTV DRIVER ACTR circuit breaker on the No. 1 PDP. 2-5-6. Directional Pedals. 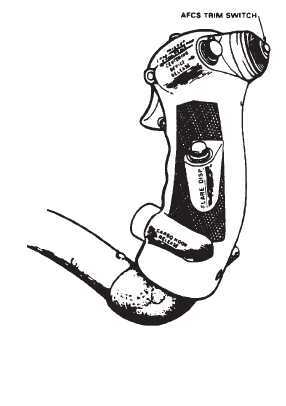 The directional pedals (7 and 24, fig. 2-1-3) are used for directional control of the helicopter during flight and while taxiing with the forward gear off the ground. When the right pedal is displaced forward, the forward rotor disk tilts to the right and the aft rotor disk tilts to the left. The opposite action occurs when the left pedal is displaced forward. An ILCA is installed to assist the pilot in moving the pedals. The pedals are adjusted individually fore and aft by pressing a lever mounted on the pedal support and mov- ing the pedal to a new position before repositioning the lever. Insure that both pedals are adjusted equally (left and right pedals in same respective hole position) and pedal adjustment lockpins are engaged. A balance spring is installed to reduce control sensitivity. 2-5-7. Advanced Flight Control System. (AFCS) a. The Advanced Flight Control System (AFCS) sta- bilizes the helicopter about all axes and enhances control response. It automatically maintains desired airspeed, altitude, bank angle, and heading. An automatic turn fea- ture, coupled to the pilot or copilot HSI (horizontal situa- tion indicator) is also included in the AFCS. b. Built In Test Equipment (BITE) is installed in each AFCS computer. This equipment is intended for ground troubleshooting purposes only. An interlock circuit through the engine condition control box prevents BITE use anytime either ECL is out of STOP. c. Power is supplied to the HDG ENGAGED, BARO ALT and RAD ALT ENGAGED lights from the DC essen- tial bus through the CAUTION PNL circuit breaker on the No. 1 PDP. The No. 1 AFCS receives AC and DC buses respectively through the AFCS NO. 1 circuit breakers on the No. 1 PDP. The No. 2 AFCS receives AC and DC power from the No. 2 AC and DC buses respectively through the AFCS NO. 2 circuit breakers on the No. 2 PDP. d. The AFCS consists of the following compo- nents: (1) A cockpit control panel. (2) Two AFCS computers in the avionics compartment. (3) Three ILCAs in the flight control closet. (4) A differential airspeed hold (DASH) actuator in the flight control closet. (5) Two longitudinal cyclic trim (LCT) actuators are installed, one in the forward upper controls, the other in the aft upper controls. (6) Roll and yaw magnetic brakes, a longitudi- nal CCDA, and a thrust CCDA are all located in the flight controls closet.